2. Employees of JFHC, HiPP Organic and their families are disqualified from entering for the Award. 3. Provision of the conference fee, accomodation, travel, subsistence allowance, and subscription to JFHC will be arranged and paid for by the organisers. The organisers will not be responsible for any monies spent by the winning entrant. 4. The winners will be announced on 30 September 2014. 5. The winner of the Award may be asked to prepare a short paper (approx 1200 - 1500 words) about their work in infant nutrition support. 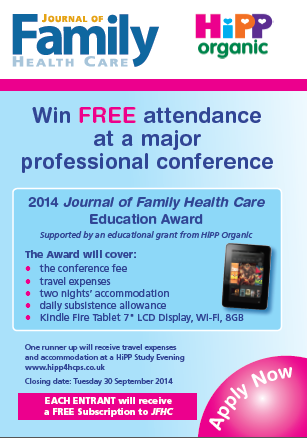 It is envisaged that the paper will be published in JFHC. The winner is not expected to be an experienced author as full editorial assistance is available.